The many operational benefits of EVPN technology can thrive if the complexity of the configuration, interworking and operational telemetry is abstracted and automated from a central orchestration system that delivers and ensures reliability and stability in the network. Automation of the configuration complex tasks allows you to continue to address your existing application connectivity requirements while transitioning to a modern L3 leaf-spine data center architecture for better agility and scale. Design and configuration automation frees you to benefit from the simplicity, increased agility, scalability and reliability of EVPN technology. It puts the Easy button into EVPN. 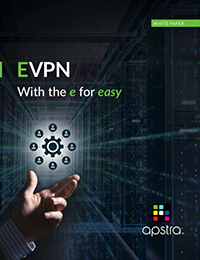 Read this white paper to learn about the challenges of implementing EVPN, as well as how Apstra addresses these challenges to put the 'Easy' in EVPN.